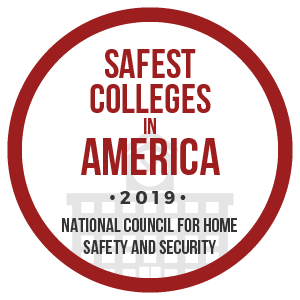 April 17, 2019 – Santa Fe College was recently named to the Safest Colleges in America List from the National Council for Home Safety and Security. SF came in 50th on the list and was the second highest ranked college in the state of Florida. The National Council for Home Safety and Security used data from law enforcement and FBI crime reports and compared 490 colleges across the country with student populations of 1,000 or more. Using information about crime rate (both violent and non-violent crimes) and police adequacy, the National Council for Home Safety and Security compiled the list. SF’s ranking is due in large part to the coordinated efforts of the Santa Fe College Police Department, Counseling Center and Behavioral Intervention Team that work in conjunction with college leadership to make SF as safe as possible. For the complete list, visit alarms.org/safest-colleges.